LunaNode’s platform allows users to rapidly and scalably “deploy reliable, performant, and feature-packed cloud servers.” Your VPS will certainly be reliable and performant; but “feature-packed” is something of an understatement. With hourly billing, snapshots, block storage, load balancers, VPS shelving (which is great for cutting down on costs! ), a customizable rescue mode… and so much more, you’ll probably discover a new useful feature every time you access their control panel. Additionally, LunaNode’s pricing gives you more value than most other providers. With their 2 GB Memory-Optimized plan, you get 2 GB RAM, 20 GB SSD storage, and 2 TB bandwidth for $7/mo; the comparable Vultr plan is $10/mo. LunaNode’s Compute-Optimized plans are also cheap, at $20/mo per dedicated CPU core. The only downside is that LunaNode leaves you wishing they were available in more locations. They have three datacenters, two in Canada (Toronto and Montreal) and one in France. Nevertheless, we’ve found that their Toronto location provides good connectivity to most of the U.S. and Canada, and their France location offers low-latency to users in western Europe. LunaNode’s pricing is incredibly affordable, at $3.5/mo per GB of RAM. Their m.2 plan gives you 2 GB RAM, 20 GB SSD storage, and 1 TB bandwidth for $7/mo. However, their cheapest plan is $5/mo, which is not ideal if you only need a very small amount of RAM (e.g. 256 MB). They also offer VPS plans that come with dedicated CPUs. For $20/mo, you can get one dedicated core and 5 GB RAM. LunaNode’s pricing also shines in other areas. Bandwidth is billed based on the bandwidth usage across all of your VPS in a location rather than per-VPS. So if you use up the bandwidth on your first VPS, but use almost none on your second, your first VPS can take advantage of the unused bandwidth. Even if you do run out of bandwidth, their bandwidth overage charge is just $3/GB (for comparison, it’s $10/GB on Vultr and DigitalOcean). Additionally, LunaNode offers several services for free! This includes DNS hosting, e-mail hosting, and uptime monitoring. Because LunaNode has so many features, I’m going to split up my review of their features into two sections. Here, I’ll discuss features that several of our other top VPS providers also offer. And then in the next section, I’ll introduce the more unique features that really make LunaNode remarkable. First, LunaNode bills their VPS hourly. This means that, if you’re testing new software, you can launch a VPS and set up the software to try it out, and delete the VPS when you’re done. If your VPS is only active for a few hours, you’ll only be charged for those hours, which typically equates to tens of cents. Second, LunaNode supports snapshots, which are basically copies of the disk of your VPS at a certain point in time. You can use a snapshot as a backup before performing a complex upgrade; if something goes wrong, you can always restore your VPS back to its earlier state. Snapshots can also be used to clone a VPS. If you spent a lot of time configuring your application, and later want to deploy multiple copies of it, you can simply create several VPS from a snapshot of your first VPS. On a critical VPS, you can enable backups, which automatically creates daily snapshots so that in case of accidental data deletion or if your VPS gets hacked, you can restore the VPS to one of the snapshots. Backups are particularly well-designed on LunaNode, as they are fully integrated with snapshots; other providers that support both snapshots and backups typically treat them differently, often leading to confusion. Next, LunaNode’s block storage service is quite impressive. A block storage volume is basically a virtual disk that you can attach to a VPS to give it extra storage space. Although other providers support block storage, LunaNode differentiates themselves in two ways: pricing and functionality. In pricing, block storage volumes on LunaNode are $30/mo per 1 TB of storage. Moreover, though, I was surprised at how seamlessly LunaNode’s block storage integrates with the rest of their platform. You can create a VPS with a block storage volume as the boot device, enabling you to manage your VPS storage independently of the VPS itself. On top of that, you can convert snapshots to volumes, and convert volumes back to snapshots. Startup scripts and SSH keys are also supported, and can be selected when you create a VPS. Startup scripts specify commands to run when a VPS boots for the first time, and SSH keys can be injected into the VPS so that you can authenticate securely without a password when the VPS comes online. Alright, time for features round 2! My favorite feature on LunaNode is the unassuming Shelve button. Shelving a VPS powers it off and releases its allocated resources so that you pay significantly less when you don’t need your VPS! Although this won’t be useful for a production website, it’s incredibly useful on a development VPS — you don’t have to worry about keeping that machine around, because after shelving it, you only pay for storage and IP addresses. LunaNode’s DNS hosting, which is completely free, is equally amazing, because of the degree of control it gives you. Want to load balance traffic between several VPS, and stop serving DNS records for VPS that are down? You can do that, just attach an uptime monitoring check with each DNS record! 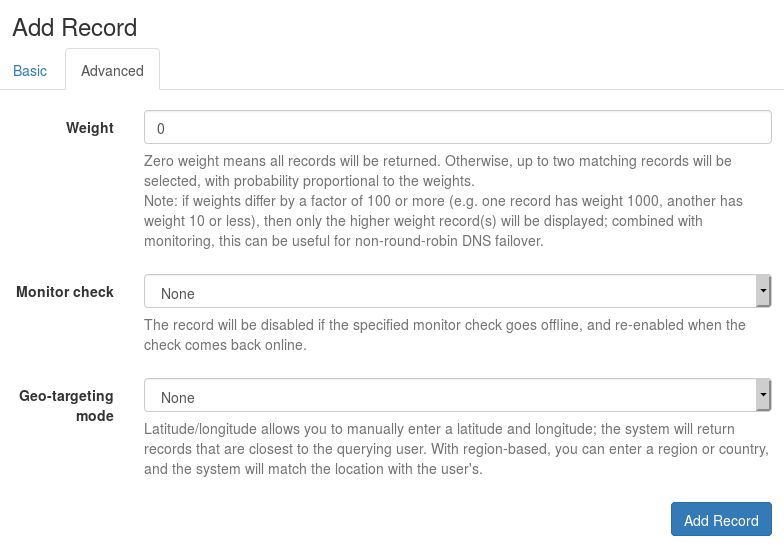 Want to serve different DNS records depending on the geographic region of your users? You can do that too! LunaNode also offers free e-mail hosting, one free load balancer, and cloud firewalls. I could go on and on about their features, but let’s stop here for now! The functionality offered by LunaNode is unparalleled in the VPS industry. Combined with their affordable pricing, LunaNode would be unbeatable if they had more locations. I use their Toronto location frequently for small and large projects alike. If you’d like to try out LunaNode, and you’re in the U.S. or Canada, you can get started with their $20 free trial.